Fordham University is a private university in the United States, with three campuses located in and around New York City. Founded by the Roman Catholic Diocese of New York in 1841 as St. John's College, it was placed in the care of the Society of Jesus (Jesuits) shortly thereafter. Today Fordham is an independent university in the Jesuit tradition. Governed by a Board of Trustees the majority of whom are lay members, Fordham retains its time-honored Jesuit traditions. These include an emphasis on care for the individual student and their potential; standards of excellence and rigor in academic study; adherence to ethical values; and a commitment to living life beyond self by contributing time and talent in service to the community. With a long tradition of excellence in academics and theology, Fordham University has over the years broadened into many disciplines of the liberal arts, as well as outreach to the global community. Over the years, Fordham has attracted notable faculty members and has produced many graduates who have achieved great success both in their individual lives and in service to the wider community. Fordham University "is committed to the discovery of Wisdom and the transmission of Learning, through research and through undergraduate, graduate and professional education of the highest quality." While the school is no longer subject to strictly religious administration, it nonetheless values and incorporates its religious history and tradition, particularly in regards to the paradigm of Jesuit educational philosophy. The University promotes a Jesuit principle known as cura personalis, which fosters a faculty and administration respect for the individual student and their uniqueness, and the Jesuit principle magis which intends to inspire service and strive for excellence in all aspects of life, even beyond the academic. Fordham University has a long standing reputation of excellence, both for secular and religious studies. Fordham University attracts students from around the world, and at the turn of the twenty-first century had registered students from approximately 90 countries in addition to every U.S. state and territory. In 2009, U.S. News and World Report, which evaluates American schools every year, ranked Fordham university overall as 61st in the country, keeping with many years of the school being listed within the top 100 schools of the U.S. Fordham's graduate schools have often been singled out for their excellence: In 2008, Fordham University School of Law, the 15th most selective law school in the United States, was ranked 25th in the nation in, the Graduate School of Social Service was ranked 17th, the Graduate School of Education was ranked 58th, and the College of Business Administration 71st. Keating Hall at the Rose Hill campus circa February 1937. Fordham University was originally founded in 1841 as St. John's College by the Coadjutor Bishop (later Archbishop) of the Diocese of New York, the Most Reverend John Joseph Hughes. The College was the first Catholic institution of higher education in the northeastern United States. Bishop Hughes purchased most of Rose Hill Manor and Estate in Fordham, the Bronx, then part of Westchester County, at $40,000 for the purpose of establishing the school. St. John's College opened with only six students on June 24, 1841, with the Reverend John McCloskey as its president. Most of the original faculty were secular priests and lay instructors. The College was paired with a seminary, St. Joseph's, which had been founded in 1839 and was in the separate charge of Italian Lazarists (also known as "Vincentians"). In 1861, St. John's College ended its connection to the seminary when St. Joseph's closed. In 1846, St. John's College received its charter from the New York state legislature, and Bishop Hughes convinced a group of Jesuits from Kentucky to staff the new school. In 1847, Fordham's first school in Manhattan opened, which, in 1861, became the separate, chartered College of St. Francis Xavier. 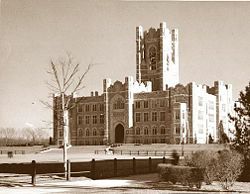 With the addition in 1905 of a law school and a (now defunct) medical school, the name was changed to Fordham University in 1907. Throughout the early twentieth century, the school continued to expand. In 1912, the university opened a College of Pharmacy, which offered a three-year program in pharmacy and did not require its students to obtain bachelor's degrees until the late 1930s. The College had a mainly Jewish student body, and in recognition of that, students were exempt from the then-required course in Catholic theology. The College's longtime dean, Jacob Diner, was also Jewish. The College of Pharmacy closed because of declining enrollment in 1972. In 1961, Fordham Law School opened at the new Lincoln Center campus—the first building to open in the Lincoln Square Renewal Project.In 1969, the colleges at 302 Broadway were moved to the new Lowenstein Building on the Lincoln Center campus, and other colleges soon followed. The middle to late twentieth century proved to be a turning point in the school's history. In 1969 the board of trustees was reorganized to include a majority of non-clergy members, and officially made the University an independent institution. Fordham College at Rose Hill became coeducational in 1974, as a result of the merger with Thomas More College (the University’s coordinate college for women opened in 1964). Fordham maintained its prestige for both secular and religious studies throughout the later half of the twentieth century. With the twenty-first century, the university once again looked at expanding and restructuring. In August 2005, the University announced a multi-year, $1 billion proposed master plan to add 1,500,000 square feet (140,000 m²) of academic, student activities, and dormitory space to the Lincoln Center campus. The development of the campus was set to begin with the expansion of Quinn Library and the construction of a new Law School building, a new student center, a dormitory, and additional parking. Future phases of the development plan included the construction of new space for Fordham College of Liberal Studies, Fordham College at Lincoln Center, the Graduate School of Business, the Graduate School of Social Service, and the Graduate School of Education. Fordham, like many universities, has also started to reach out to the global community. In April 2008, Fordham entered into an affiliation with Heythrop College, the Jesuit specialist Philosophy and Theology College of the University of London, which is located near Kensington Square, in central London. The University of London Consortium of Colleges consists of such institutions as King's College London, University College London, and the London School of Economics and Political Science. Fordham also made plans to house its London Dramatic Academy and College of Business Administration programs at Heythrop. Fordham University has three main campuses located in New York: Rose Hill, Lincoln Center, and Westchester. The Administration Building at the Rose Hill campus, constructed circa 1841. The Southern Boulevard entrance to the Rose Hill campus. The Rose Hill campus, established in 1841, is home to the undergraduate Fordham College at Rose Hill, the College of Business Administration, and a portion of the Fordham College of Liberal Studies as well as the Graduate School of Arts and Sciences, and the Graduate School of Religion and Religious Education. Located on 85 acres (340,000 m²) in the north Bronx, it is among the largest "open space campuses" in New York City. The campus is bordered by the New York Botanical Garden, the Bronx Zoo, and "Little Italy of the Bronx" on Arthur Avenue. Rose Hill is also home to the University Church, which was built in 1845 as a seminary chapel and parish church for surrounding farms. The gothic-style church is an official New York City landmark and contains the original altar from Old St. Patrick's Cathedral along with stained glass windows first intended as a gift by Louis-Philippe of France for the cathedral. The front of the Leon Lowenstein Building at the Lincoln Center campus. Peter, Fisher of Men statue at the Lincoln Center campus. The Lincoln Center campus, established in 1961, is home to the undergraduate Fordham College at Lincoln Center and a portion of Fordham College of Liberal Studies, as well as the School of Law, the Graduate School of Business Administration, the Graduate School of Education, and the Graduate School of Social Service. 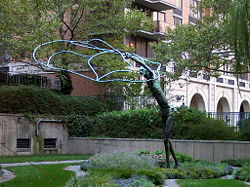 The eight-acre campus occupies the area from West 60th Street to West 62nd Street between Columbus and Amsterdam Avenues, in the cultural heart of Manhattan. Across the street is one of the world's great cultural centers, Lincoln Center for the Performing Arts; nearby are Central Park, Broadway, and Columbus Circle. In 2008, the University moved Fordham College of Liberal Studies (Westchester Division), graduate schools of Business Administration, Education, Social Service, and Religion and Religious Education, from the Marymount campus to 400 Westchester Avenue, in West Harrison, New York. Fordham signed a 20-year lease for the new campus. The new campus includes a three-story, 62,500-square-foot (5,810 m²) building on 32 landscaped acres with a stream and pond. The facilities include 26 newly designed classrooms featuring technological amenities such as "smart boards," teleconferencing capabilities, and newly installed seating and learning areas. In addition, faculty offices and administrative support space, a library resource center, a food service facility, and meeting areas both indoor and outdoor for student sessions are available. Over $8 million was spent in renovation to provide the University with green building technology, including the design of academic facilities surrounding a large central courtyard.Cite error: Closing </ref> missing for <ref> tag Fordham has other spiritual facilities, such as the Philip H. McGrath House of Prayer, located in Goshen, NY, which is used exclusively for Fordham's Retreat Ministries. The McGrath House is situated in a rural, residential area about seventy miles northwest of Fordham's Rose Hill campus. The McGrath House has facilities for a large group of students and retreat coordinators to stay overnight while participating in a Fordham Retreat. 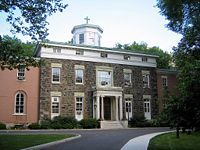 Fordham Campus Ministry regularly hosts non-compulsory retreats at the McGrath House, including Emmaus, Kairos, Charis, Global Outreach Retreats, and other specialized retreats. In December 2007, the University established the Fordham Museum of Greek, Etruscan and Roman Art at the William D. Walsh Family Library on the Rose Hill campus. The museum contains more than 200 relics from classical antiquity, ranging from Greek terra cotta vases to Roman marble heads to Etruscan urns. The museum was a gift from William D. Walsh, a 1951 graduate and founding chairman of Sequoia Associates. It is the largest collection of its kind in the New York metropolitan area. Fordham has almost 100 different academic programs. Many of the undergrad degrees are aspects of the usual Liberal Arts colleges, such as Literature, Anthropology, Business, Economics, Chemistry, Biology, and History. There are also several Divinity and Theological undergraduate programs that are sometimes connected to other disciplines. The differing graduate level colleges offer many different programs, such as Law, Theology, Business, Education, Social Work, and programs in the liberal arts and sciences. The Beijing International MBA Program (BiMBA) is a joint venture between a consortium of Jesuit Colleges and Universities in the United States and Peking University and is managed by Fordham University and the China Center for Economic Research (CCER). BiMBA was founded in 1998 and is located on the campus of Peking University in Beijing, People's Republic of China. BiMBA enrolls over 400 students a year in traditional part-time and full-time MBA programs, and in Executive MBA (EMBA) programs. The other international program is the London Drama Academy (LDA) at Fordham's Bloomsbury-area London Center, which offers classes on British acting, using a primarily practical approach. The Academy was founded in the 1970s by Marymount College and a group of tutors from the Royal Academy of Dramatic Art (RADA). It offers semester- and year-long sessions, with classes taught by working RADA-trained theater professionals. Fordham University comprises four undergraduate colleges and six graduate schools on three campuses. Fordham students have numerous activities and interests beyond academics. The University supports 22 men's and women's varsity teams and a number of club teams, plus a significant intramural sports program. The Fordham Rams are members of NCAA Division I and compete in the Atlantic 10 Conference in all sports except football. In football, the Rams play in the Patriot League of NCAA Division I Football Championship Subdivision. Fordham athletics gained early fame for college football in the beginning of the twentieth century, particularly with the success of the famous "Seven Blocks of Granite." In addition, the University launched the careers of dozens of professional baseball players, including a Hall of Fame inductee, Frankie Frisch, known by the further-alliterative nickname, "The Fordham Flash." The Sixth Man Club, supports the Fordham University Men's and Women's basketball programs. The club was founded in the early 1990s by a group of Rose Hill College seniors. The Sixth Man cheers on and roots for the Rams from the Section 8 bleachers in the Rose Hill Gym. Fordham has several student publications, including the literary/creative magazines Red Rover and The Ampersand, and news publications The CBA Business Journal, The Fordham Ram, and The Fordham Observer. Fordham also offers several student run/oriented media outlets, such as WFUV, 90.7 FM the University's 50,000-watt radio station, with studios located in Keating Hall on the Rose Hill campus and the transmitter located atop a building owned by Montefiore Medical Center, and the Fordham Nightly News (FNN), Fordham University's evening news program since 2004, created and produced by students. Fordham has several performing clubs and organizations, including the Fordham University Choir, whose repertoire includes both sacred and secular music, the Fordham University Women's Choir, the all-male a cappella group the Fordham Ramblers, and the all-female a cappella group the Fordham Satin Dolls. Fordham has several acting groups, including the Fordham University Theatre Company, the theatrical troupes Mimes & Mummers, and the Fordham Experimental Theatre, and the Expressions Dance Alliance. Fordham University also has an excellent Debate Society. In 1982, the American Parliamentary Debate Association (APDA), Inc. was founded at Fordham, during a tournament called the "Fordham Fandango." FDS is still very active on APDA, and regularly places among the top teams in the country. The team competes weekly on APDA, but also occasionally attends international tournaments, ranking well in the World Universities Debating Championship standings. The Gannon Speech and Debate is based at the Lincoln Center Campus, and engages students in forensics training so that they may compete intercollegiately. The club is named for the Rev. Robert I. Gannon, S.J., President of Fordham from 1936–1949, considered to have been a popular and effective speaker. Alumni of the club have been successful in earning fellowships and awards. Global Outreach! (commonly known as GO! ), is a student led, university sponsored organization dedicated to educating students about issues of social justice and individual responsibility through service trips to global and domestic locations. Separate programs on each campus currently sponsor 27 annual trips ranging from Thailand to East New York, and dealing with such diverse issues as public health, affordable housing, migrant labor, and disaster relief. Fordham has many traditions. The university's mascot, a ram evolved from a rowdy cheer that Fordham fans sang during an 1893 football game against the United States Military Academy at West Point. The students began cheering "One-damn, two-damn, three-damn…Fordham!" The song was an instant hit, but "damn" was later changed to "Ram" to conform to the university's image. The Victory Bell, which is mounted outside the Rose Hill Gym, was a gift to Fordham University by Admiral Chester W. Nimitz from a Japanese naval vessel sunk during World War II. It was blessed by Cardinal Spellman, and was first rung by the President of the United States, Harry S. Truman in 1946 for the Charter Centenary of the University. Tradition now holds that it be rung by each Fordham senior player after victorious home football games and its ringing also marks the start of the commencement ceremonies each May. The University annually presents a concert of Lessons and Carols during the Christmas holiday season. The ensemble university choir presents one evening concert at the large and dramatic Church of Saint Paul the Apostle adjacent to the Lincoln Center Campus, and one afternoon concert at the more humble and intimate University Church at the Rose Hill Campus, each year. Fordham College at Rose Hill annually stages an Encaenia on an evening near the conclusion of the academic year. Faculty, administrators, and students process in academic regalia to a ceremony where candidates for degrees at the current year's commencement are presented awards and honors. The ceremony includes a sentimental speech by the college's valedictorian, as well as the traditionally more humorous yet equally endearing speech by the honorary "Lord" or "Lady of the Manor" selected for the evening. Alan Alda, six-time Emmy Award and six-time Golden Globe Award-winning actor. William Casey, former United States Director of Central Intelligence. Mary Higgins Clark, best-selling suspense novelist. Geraldine Ferraro, former Representative to the United States Congress, the first woman Vice Presidential candidate by a major political party in the United States. Frankie Frisch, known as the "Fordham Flash," Baseball Hall of Famer. General John "Jack" Keane, retired four-star General and former Vice Chief of Staff of the United States Army. Bob Keeshan, television's multiple award-winning Captain Kangaroo. G. Gordon Liddy, lawyer, political operative for President Richard Nixon, leader of the White House Plumbers, political pundit, and radio show host. Vince Lombardi, football coaching legend. Charles Osgood, three-time Emmy Award and two-time Peabody Award-winning journalist and Radio Hall of Fame inductee. Eugene Shvidler, Russian-American billionaire and international oil tycoon. Denzel Washington, two-time Academy Award and two-time Golden Globe Award-winning actor. Bruce Andrews, poet and theorist on state and global capitalism. Daniel Berrigan, S.J., poet-in-residence and world-renowned peace activist. Joseph Campbell, poet, Irish studies scholar, Irish republican and POW. W. Norris Clarke, S.J., philosopher and noted authority on St. Thomas Aquinas. Avery Cardinal Dulles, S.J., noted theologian, Cardinal of the Roman Catholic Church. Brian Davies, OP, noted philosopher of religion and Aquinas scholar. Patrick Heelan, S.J. noted philosopher of science. Victor Francis Hess, Nobel Laureate for physics. William T. Hogan, S.J., economist and noted authority on the steel industry. Paul Levinson, author of The Plot To Save Socrates and winner of the 1999 Locus Award for Best First Novel. Mark Massa, S.J., authority on American Catholicism. Matthew Maguire, two-time OBIE Award-winning actor, director, and playwright. Marshall McLuhan, communications theorist and coiner of the phrase, "the medium is the message." Frederick Marotto, mathematician, author of the "Marotto Theorem" dealing with Chaos theory. 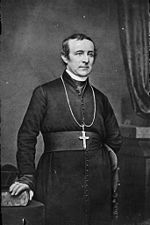 William O'Malley, S.J., actor in the film The Exorcist, for which he was also a technical adviser; author of numerous books. Diana Villiers Negroponte, professor of history and law; wife of U.S. Director of National Intelligence John Negroponte. Lawrence J. Sacharow, OBIE Award-winning director. Asif Siddiqi, historian specializing in the Cold War Era space race between the United States and the Soviet Union. He is a leading authority and scholar on the Soviet Space Program. Daniel Soyer, historian, author, and authority on Jewish immigration into New York City. ↑ Fordham University, Discover Fordham: Mission. Retrieved January 11, 2009. ↑ Fordham University, Fordham's Jesuit Tradition. Retrieved January 11, 2009. ↑ Fordham University, 2006-2008 Undergraduate Bulletin. Retrieved January 11, 2009. ↑ 4.0 4.1 Best Colleges 2009, National Universities Rankings, U.S. News and World Report, 2009. Retrieved January 11, 2009. ↑ 5.0 5.1 5.2 5.3 5.4 Raymond A. Schroth, Fordham: A History and Memoir (Fordham University Press, 2008, ISBN 0823229777). ↑ 6.0 6.1 Discover Fordham, Fordham Facts: History, Fordham University, 2009. Retrieved January 11, 2009. ↑ Fordham University, On Exhibit in the Walsh Library: The Blanche and Joseph Slotnik Pharmaceutical Collection. Retrieved January 11, 2009. ↑ 8.0 8.1 8.2 8.3 8.4 8.5 Emily Intravia, Fordham University: Off the Record (College Prowler, 2006, ISBN 142740061X). ↑ Fordham University, Fordham Unveils Lincoln Center Master Plan. Retrieved January 11, 2009. ↑ Fordham University, Fordham Establishes New Campus in Central London. Retrieved January 11, 2009. ↑ Fordham University, Westchester: Campus and Facilities. Retrieved January 13, 2009. ↑ Robin Pogrebin, Fordham Opens Its Gift: An Antiquities Museum, The New York Times, Dec. 6, 2007. Retrieved January 13, 2009. ↑ Fordham University, BiMBA. Retrieved January 13, 2009. ↑ Baseball Library, Frankie Frisch. Retrieved Janaury 12, 2009. ↑ Fordham University, The Sixth Man Club. Retrieved January 12, 2009. ↑ Fordham University, Fordham Student Wins British Marshall. Retrieved January 12, 2009. ↑ 17.0 17.1 Fordham University, Campus Ministry, Concert Choir. Retrieved January 12, 2009. Feddeck, Fred C. Hale Men of Fordham: Hail! Trafford Publishing, 2001. ISBN 1552125777. Fordham University Staff, Office of the Sesquicentennial. As I Remember Fordham: Selections from the Sesquicentennial Oral History Project. Fordham University Press, 2001. ISBN 0823213382. Gannon, Robert Ignatius. Up to the Present: the story of Fordham. Doubleday, 1967. Intravia, Emily. Fordham University: Off the Record. College Prowler, 2006. ISBN 142740061X. Schroth, Raymond A. Fordham: A History and Memoir, Revised Edition. New York, NY: Fordham University Press, 2008. ISBN 0823229777. Taaffe, Thomas Gaffney. A History of St. John's College, Fordham, N.Y. The Catholic Publication Society Co., 1891. This page was last modified on 18 April 2017, at 19:49.